WebMail provides a way of checking your email messages over the web, at home, from work, or anywhere in the world. Your account has a limit to the amount of email that can be stored on the server, though, so you should download your messages using a regular email client like Outlook Express, Eudora, or Netscape on a regular basis. If you receive a message from Expedient indicating that you are reaching your limit, please delete some mail from the server, or download it to your computer. Messages stored in the "trash" folder are automatically deleted when they are 5 calendar days old. Effective Thursday Feburary 15th, 2018 all mail clients will need to change their outbound server settings for authentication. 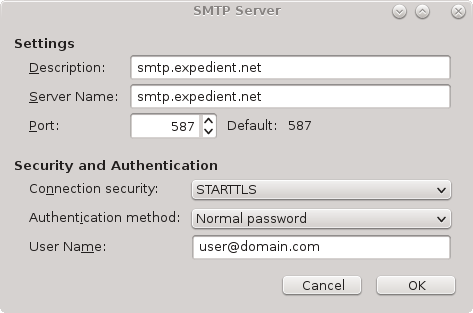 SMTP Mail server settings will be required use either port 587 with STARTTLS or port 465 with SSL/TLS.